Mission San Jose Elementary School in Fremont, California has, for decades, fielded the most successful chess teams the Golden State has ever produced. Year after year, the relatively small public school’s chess club trains hundreds of students in the art of aggressive chess play. Those who excel at the club are invited to participate in the more exclusive Monday night team meetings. There, as he has done since the 1980’s, Head Coach Joe Lonsdale uses his demo board to show practical examples of masterful chess games played by the great masters of the 19’th century as well as recent gems played by the young Mission San Jose Elementary chess players. After the lesson, students are paired into a stepladder tournament and compete using clocks while notating their moves. Every week, almost every game played gets analysed by Joe Lonsdale, Richard Shorman, Chris Torres or a graduate of the chess team. Joe’s labor of love has created a chess team that has an unrivaled success rate at major chess tournaments and a team jersey that can barely fit all the state chess titles the school has won. Mission San Jose Elementary School has also fares well at the national level despite the fact that the USCF National Elementary Chess Championships are rarely held on the west coast. In 2009, Mission San Jose Elementary School became the first school from California to ever win the National Elementary Chess Champion Title. The following year, the Mission San Jose Elementary School team placed second in the K-1 Championship Section, tied for fourth place in the K-3 Championship Section, finished third in the K-5 Championship Section and placed 9th in the K-6 Championship section. In 2011, we even did better! Mission San Jose Elementary School placed second in the k-6 Championship Section, fourth in the k-5 Championship Section, fourth in the k-3 Championship Section and third in the k-1 Championship section. According to a long bearded USCF representative I road back to the airport with, this is the best overall achievement of any school in the history of the USCF National Elementary Chess Championships. Of course, as hard as us coaches work, it is the players who deserve the credit and recognition. Sixth grader Arman Kalyanpur was our team leader scoring an impressive 5.5/7. Fifth Grader Alvin Kong achieved a score of 4.5/7. Sixth Grader Erik Wong also scored well with 4/7. Our fourth member of the k-6 Championship Section was Alex Yin who completed the tournament with 3.5/7. Our k-5 team was led by fourth grader Amit Sant with a score of 5/7. Fifth graders Steven Li and Shalin Shah who both finished with an impressive 4.5/7. Another fifth grader, Eric Zhu, managed to score 4/7. Fifth Grader Sayan Das scored 3.5/7. Our k-3 team was led by second grader John Andrew Chan who finished with 5/7. Next came second grader Mihir Bhuptani and third grader Ojas Arun who both scored 4/7. Second grader Alvin Zhang had a strong showing with 3.5/7. Second Grader Luke Zhao, who had the flu, finished with 3/7. Edward Liu, who attended his first Nationals, finished with 2.5/7. The MSJE k-1 team’s top scorer was kindergartener Rishith Susarla with and impressive 5/7. Next came first graders Chenyi Zhao and Soorya Kuppam with a score of 4.5/7. First Grader Jeffrey Liu managed to score 4/7. The quickly improving Kindergartener Amulya Harish finished with 2.5/7. It was a real pleasure to watch all of you achieve such great success in the most prestigious tournament of the year. As your chess coach, I am very grateful to have shared so many memorable moments with you during the 2010-2011 school years. Congratulations! On paper, the ratings favorite is Ben Rood of California. A student at the Chris Torres Chess and Music Academy, Rood has shown tremendous improvement in the last several weeks. His recent victories over 2nd grade national co-champion Josiah Paul Stearman and a win against an ‘A’ player show that Rood is in great form. Torres believes young Ben is “destined to become a national champion,” and his play at the Northern California state championships gives some credence to his teacher’s prediction. Another Torres student, Chenyi Zhao, had a recent ratings slip, but is still a force to be reckoned with. A third, Milind Maiti, is among the country’s top kindergarteners. There is still time to sign up for the Torres Chess and Music Academy’s summer chess camps in California. Please visit www.ChessAndMusic.com for more information. Three Northern California chess prodigies performed extremely well during the first day of the 2011 Calchess Scholastic State Championships. Kindergartener Milind Maiti scored a perfect 5/5 and became the 2011 Calchess Kindergarten State Champion. First Grader Chenyi Zhao scored 2.5/3 in the k-3 championship. Ben Rood, another first grader, scored a perfect 3/3 on day one in the same section. I am extremely proud to have spent time training all three of these super talents. Tomorrow three of my favorite chess students will begin play at the 2010 National K-12 Chess Championship in Lake Buena Vista, Florida. As the President of the Torres Chess and Music Academy, I have had the distinct pleasure of coaching many of the top ranking scholastic chess players in the United States and can comfortably state that the three players described below are among the finest young chess players I have ever coached. In 2009, then Chinese citizen Chenyi Zhao impressed her Country by placing very highly at a prestigious chess tournament in Beijing. Although only 5, it seemed Chenyi was destined to be placed in a state run chess school for the extremely gifted. Within a few short months, Chenyi Zhao had immigrated to the United States and found herself in Fremont, California attending chess classes run by the Torres Chess and Music Academy. 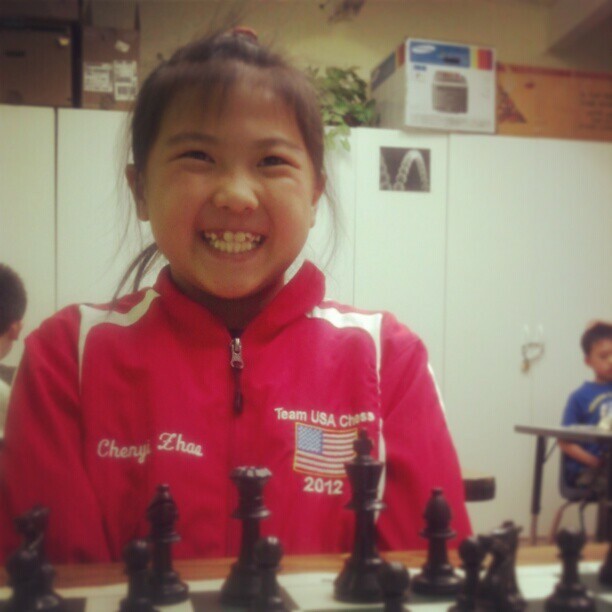 Chenyi is now considered one of the top chess players for her age in California and a serious contender for a top place finish at the 2010 National Scholastic Chess Championship. Milind Maiti appeared in the Collins Elementary School Chess Team in September of 2010. Because the Collins Chess Team is run by the Torres Chess and Music Academy, it was no small accomplishment that Milind progressed to the “Advanced” class by week two. Milind posseses natural tactical abilities that are beyond anything one would expect from a Kindergartener. He is truly a chess prodiogy of the highest level and will be a contender in the 2010 National Scholastic k-12 chess championship. For months before I received the fateful email, I had been eyeing Ben Rood’s chess games with the opinion that Ben was destined to be a national chess champion. (Having worked with several national chess champions and one world chess champion, I tend to gauge talent very accurately.) Aproximately eight months after I first noticed Ben Rood, his mother emailed me inquiring about private chess lessons for Ben. It turned out that Ben was only willing to accept private chess lessons from Chris Torres. I immediately accepted and now train with Ben Rood weekly in Walnut Creek. Observing Ben Rood’s growth under my tutoring for the past few months is exceptionally rewarding and I feel blessed to be a part of his learning process. In fact, chess comes so easily for Ben Rood that it is my professional opinion that Magnus Carlsen should start preparing for him immediately! In conclusion, should any child be unfortunate enough to sit across from Chenyi Zhao, Milind Maiti or Ben Rood at the 2010 National K-12 Chess Championship…they should be verrrry afraid! For months before I received the fateful email, I had been eyeing Ben Rood’s chess games with the opinion that Ben was destined to be a national chess champion. (Having worked with several national chess champions and one world chess champion, I tend to gauge talent very accurately.) Aproximately eight months after I first noticed Ben Rood, his mother emailed me inquiring about private chess lessons for Ben. It turned out that Ben was only willing to accept private chess lessons from Chris Torres. I immediately accepted and now train with Ben Rood weekly in Walnut Creek. Observing Ben Rood growth under my tutoring for the past few months is exceptionally rewarding and I feel blessed to be a part of his learning process. In fact, chess comes so easily for Ben Rood that it is my professional opinion that Magnus Carlsen should start preparing for him immediately!